If you were wondering about the lack of recent posts, then I probably should explain that I have spent the last six months cycling around Peru, raising awareness for the children. I can tell you it was a real eye-opening experience, apart from when it was dusty. Prior to that, I spent a lot of time having dinners across the globe with committed edupreneurs, changemakers and changepreneurs. At one such event, I found myself in discussion with Andreas Schleicher of the OECD and PISA. He was kind of bummed-out that the most recent set of PISA results showed the wrong thing; that inquiry learning was associated with worse science scores. We knew that wasn’t right and so we chewed it over, along with the poached wild salmon with a watercress and butter reduction. After a while, I was struck by an epiphany. A light bulb literally went on inside my head. “It must be that teachers simply aren’t doing inquiry right!” I exclaimed. Everyone around me nodded their heads in furious agreement. We all knew that I had nailed the problem. That night, I vowed to the assembled throng that I would save inquiry from teachers doing it all wrong. 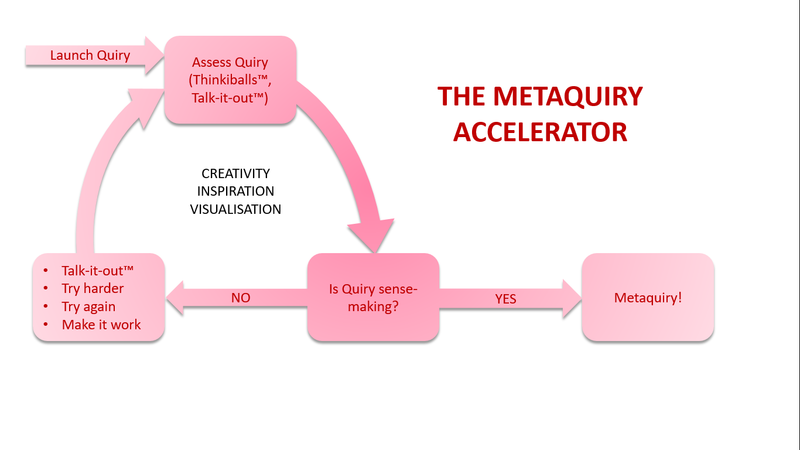 And thus was born Metaquiry. A momentous moment indeed! Hubert On is lead educator at Archipelago International School, UA. He takes up the story from here. “We were keen to develop 21st century skills such as the ability to see connections between subjects and to manipulate knowledge in new contexts,” On explains, his deep brown eyes glistening as he gently caresses his velvet fringe. I listen, nodding sagely in recognition of this convex problem. “I am glad,” I reply, as a burst of birdsong issues from the classroom speakers to signal the end of recess and similing, happy children rush to class! These express Thinkiness as a provocative verb construct. A doing. However, as we continued to work with the complex and surprising concept of Thinkiness over time, we began to realise that there were different levels, with some tasks and conceptualisations being Thinkier than others. It was while the team here at West Bay University were contemplating Deleuze’s concept of becoming that we came-up with what has come to be our powerful metaphor for how this kind of development comes about. Rather than going up like a tree does, we decided to express the increasing intensification of Thinkiness as a series of different depths. I’m guessing you’ve not seen anything like this before and neither had we. The beauty and simplicity of the abyssian metaphor immediately struck us as a close correlate of going deeper and further into our students’ heads; precisely what Thinkiness is all about! This clearly illustrates that Thinkiness is not dichotomous. The direct teaching of indigestible facts has a role to play in developing Thinkiness, it’s just that it’s not a very important one and is potentially a form of abuse. 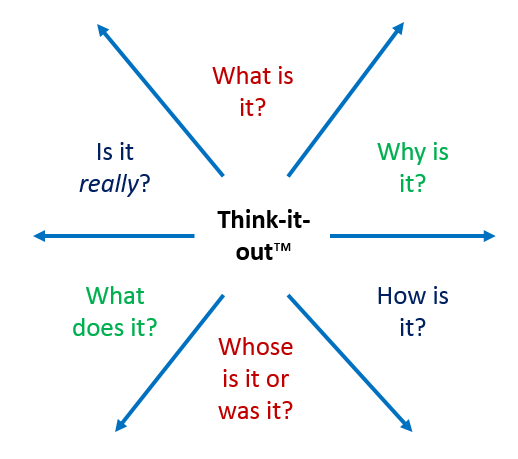 Instead, all practitioners in their own myriad ways and using a full spectrum of pedagogical techniques can develop Thinkiness in an authentic and relevant manner that is true to themselves and their students, now that they have this diagram. For some time now, here at the Extraordinary Learning Foundation™, we have been working on Actionizing Thinkiness. This is why we developed the Think-it-out™ toolkit. We have been working with teachers to help engage more thinking in their otherwise thought-free lessons. However, we have encountered a problem. Teachers typically use the toolkit to direct questions to students in class. In other words, the teacher maintains complete control over the learning episode. 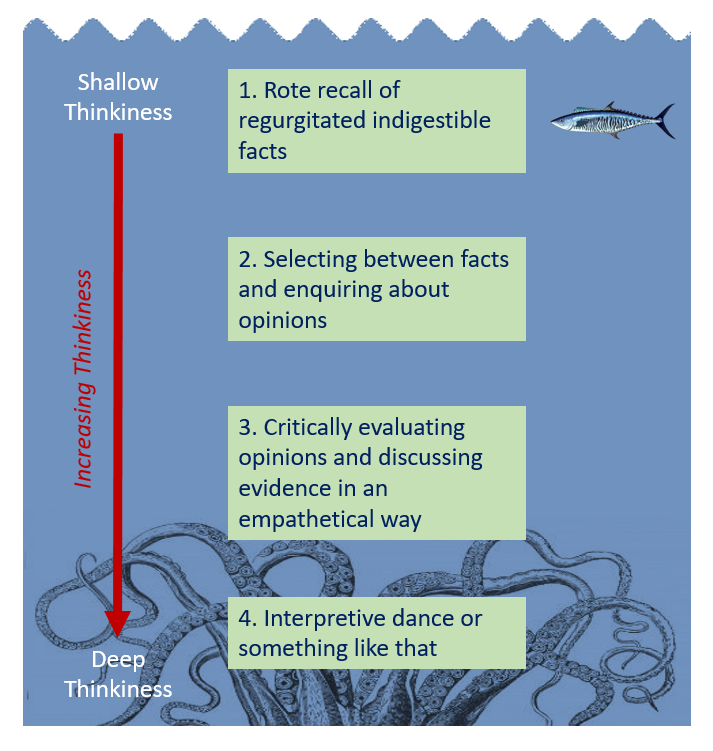 This is self-evidently undesirable so we wondered whether we could develop a model of co-deliveracy that was authentic, engaging and allowed learners to take control of the thinkiness. This is the thinking behind the thinking that led to us thinking-up the idea of Thinkiballs™. Mace Jakins is a fifth grade social studies teacher at Benington International School, UA. His chestnut hair shines as he describes the process of working with one of our Extraordinary Learning Foundation™ Associates on developing a pedagogy of Thinkiness that was also a pedagogy of authenticity and respect. “We had the idea of writing out the Think-it-out questions on pieces of paper and then screwing these up into balls,” Mace explains. Mace takes a gulp of his double soy macchiato and pauses. He eyes glisten moistly as he continues. So I asked Mace how he moved past that. I am in the classroom of Julian Malvolio at Bayswater Elementary in Kunnunna, UE. He is setting up for the day; about to teach his Grade 5 creative writing class. We take five to have a chat about what’s bugging him. I have been thinking about this problem for some time and, after much deliberation, I have decided that I am right. The crux-point is one of a lack of understanding. Sure, kids can go through some kind of procedure to write a story, select characters and so on. But the ways this is done can be learnt and practised rote. There is much more to writing than simply placing words together, one after the other. Often, the writing is derivative, focusing on wizards and dragons. 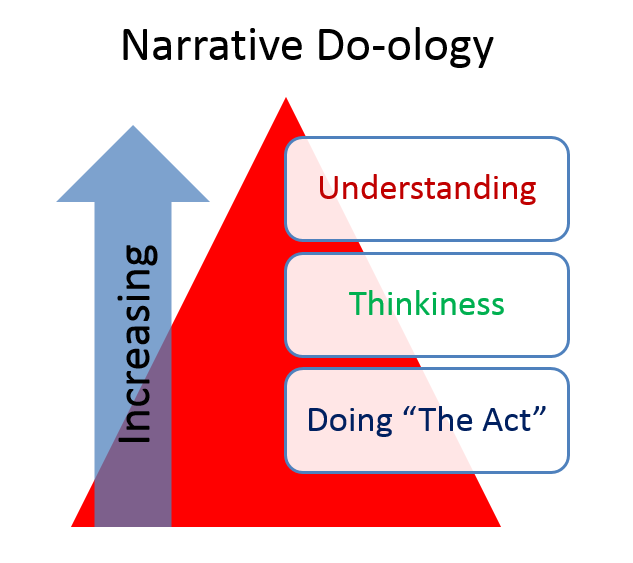 This is why here, at the Extraordinary Learning Foundation™, we have developed the process of Narrative Do-ology™. By moving away from simply regurgitating prose, we ensure that students truly understand the plots that they have invented themselves. The process starts with “The Act” – a way of doing that may or may not involve the construction of formulaic words. It is about telling a story. Then, we actionize thinkiness in order to metacognitivise and truly consider the thinking that we will be deploying in order to deal with the concepts that we intend to think about. Finally, we move to the process of understanding the narrative. To do this, children draw diagrams of the narrative structure or express it with abstract symbols. A delta, “Δ”, might indicate a key character, an arrow could represent a journey and an equals sign might signify an equivalence. Dialogue can be tricky. It is this process that I have been working on with Julian. He is grateful to me for my wise words and for the Extraordinary Learning Foundation™ for making it possible for him to actuate this advice.